How to insert the different Ellipsis … marks into Microsoft Word, Excel, PowerPoint or Outlook. Both in Office for Windows and Office for Mac. There are different ellipsis styles but only one directly supported in Word and Outlook. The ellipsis character. A single symbol that looks like three dots close together. The Word/Outlook default. Three periods separated by non-breaking spaces – the Chicago Manual of Style format. The single character ellipsis is what Word and Outlook gives you when typing three dots / fullstops in a row. That’s how most people type ellipsis, whether they realize it or not. Word also has a special shortcut for ellipsis Ctrl + Alt + . That shortcut or AutoCorrect insert the ellipsis symbol from Unicode, officially called Horizontal Ellipsis. You can change or remove that. If you or your organization prefers the AP or Chicago style of ellipsis, it’s perhaps easiest to change the AutoCorrect accordingly. Typing three fullstop/period will change to whichever symbol you prefer. For AP Style (three dots in a row), remove the Word default AutoCorrect so that typing three period/fullstops goes unchanged. Chicago Style, replace the Autocorrect entry for … to the Chicago ellipsis with non-breaking spaces. Copy / Paste the string into the With … field. Insert | Symbols | Symbol and look for the Horizontal Ellipsis symbol. 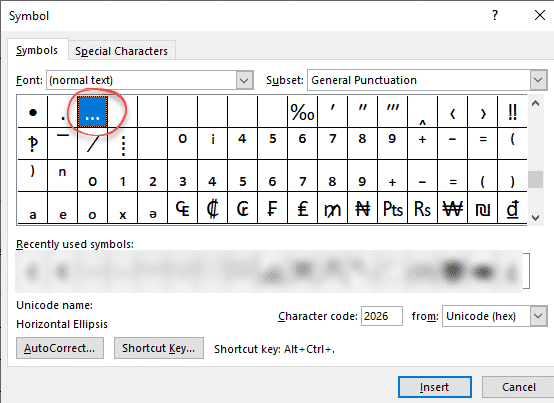 In Windows there are several shortcuts to enter the Ellipsis … character into any program, but they use a numeric keypad, not the number row above the letters. Character Map has a search feature, something missing from the Insert | Symbol in Office. On a Mac, Command + Control + Spacebar shortcut to open the Character Viewer. Search for ” Ellipsis ” and the Viewer should find the symbol you need.